The highly anticipated EFS Liquid Shot at will be introduced at Interbike on September 23, 2008. The EFS Liquid Shot has been in development for two years and is the result of collaboration between First Endurance athletes, customers, retailers, and the First Endurance Research and Development team. First Endurance EFS Liquid Shot will be available in limited quantities from ProLine Sports Nutrition Mid-October 2008. 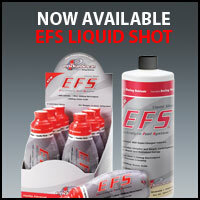 Each EFS Liquid Shot delivers 400 high-quality calories. Over 1500mg electrolytes (so you don't need to bother taking extra electrolyte pills) and 1000mg of amino acids. The Liquid Shot flask has a re-sealable pop-top that allows you to take as little or as much as you want. It's also refillable and 100% recyclable. Unlike the gels' that are on the market, the EFS Liquid Shot does not contain any gelling agents, which slow down absorption and digestion. The First Endurance product line was designed from the beginning to work as a complete endurance system. Each product has been designed to compliment the others. With the addition of the EFS Liquid Shot, First Endurance now offers everything an endurance athlete needs to maximize endurance and performance. There's no reason or need to use anything else. PureSport Recovery helps your body get into the recovery zone quickly and bounce back after serious physical activity. PureSport Recovery promotes recovery after exercise by accelerating the replacement and storage of muscle fuel. The added protein reduces muscle damage and induces muscle repair. Supplying electrolytes and lost fluids rehydrates and prepares you to get back out there so you can train hard day after day. PureSport Recovery's formula surpasses other sports recovery drinks. Taken within 15 minutes after exercising, the protein and carbohydrate mix advances muscle recovery and increases fuel storage greater than carbohydrate alone. PureSport Recovery's energy restoring blend of carbohydrates, rather than just one type, works quicker and better overall to help you recover and reload. The PureSport Recovery system gives you the edge with faster training adaptation. PureSport Workout is a rehydration drink for a body in motion. PureSport Workout replaces lost fluids and electrolytes, restores fuel during exercise for more energy and improved performance, and enhances recovery with added protein. Puresport Workout is a superior sports drink. The unique mix of carbohydrate and protein promotes better fuel utilization as well as reduces muscle damage. This mix also enhances fluid retention and rehydration better than carbohydrate alone. PureSport Workout's combination blend of carbohydrates works faster and more efficiently getting fuel to your muscles and yet contains much less sugar than traditional sports drinks. PureSport Workout (patent pending) prepares the human body for strenuous athletic activity by delivering a beneficial balance of carbohydrates, protein/amino acids and electrolytes. When used prior to and during vigorous exercise, PureSport Workout dramatically enhances exercise results by improving endurance and reducing muscle tissue damage. Confused about nutritional products? Here's a simple answer: there are no simple answers. Fact is, nutrition is a fairly complex science, and the simplistic products sold as snack foods and soft drinks are utterly inadequate to meet the needs of competitive cyclists. Now enter Dr. Paolo Sorbini with Enervit, the world's only complete, integrated, modular sports nutrition system designed expressly for elite athletes. In addition to some of the most sophisticated nutritional science in the world, Enervit's genius lies in its unique modular approach: just select products from the chart to match the specific demands of your workout or competition and you're ready to ride. Long a favorite among elite European athletes (where in some markets it outsells the #1 energy product in North America by more than two to one), the Enervit modular energy system will be available soon at the elite North American retailer, ProLine Sports Nutrition. Could boost your VO2 max and performance. For endurance athletes looking to transform their performance and go beyond their personal best. Viper Turbo is the most potent phosphate buffer and endurance formulation on the market. Viper Turbo uses a research proven formula which could boost oxygen transport (VO2 max) and increase your endurance performance in 3 days. Maximum oxygen uptake or VO2 max measures the body's ability to take up and use oxygen; which is the main factor contributing to endurance performance. Some scientific studies have shown that the unique phosphate formula in Viper Turbo could increase VO2 max by 10%. The Viper Turbo formula is ideal for hard training endurance athletes and could reduce your 10km running times. Using Viper Turbo is easy: to aid performance, simply take the capsules recommended on the label for 3 days before your big event - it's that simple! If you are a runner, cyclist, rugby player, footballer, triathlete or swimmer you will find Viper Turbo amazing. Each bottle contains up to 4 loading cycles to cover major events or races. Legal in all IOC/WADA competitions.